Bluefin’s Decryption as a Service (DaaS) solution, Decryptx, enables partners to integrate our validated solution into their platform or gateway and offer PCI P2PE directly to their clients – with no change to the payment processing relationship. View our current Decryptx partners. With Decryptx, the only part of the transaction that Bluefin requires is the P2PE payload, which contains the swiped, keyed or EMV card data encrypted within the PCI-validated device. Bluefin decrypts the cipher text within our secure HSM environment and sends the PAN and track data back over an encrypted connection. Each partner is assigned a dedicated partner manager that interacts with project management for Decryptx implementation, the marketing team for promotion, and the sales team for rollout. Additionally, Bluefin handles all aspects of device management, chain of custody and customer support for our Decryptx partners’ clients. P2PE device key injection is done by one of our two certified Key Injection Facilities (KIFs) and then the devices are shipped securely to the merchant. Bluefin’s P2PE Manager enables merchants to deploy and terminate devices, track device shipping, and download reports for PCI compliance. Bluefin provides our partners a comprehensive marketing program that includes webinars, case studies, and educational material. 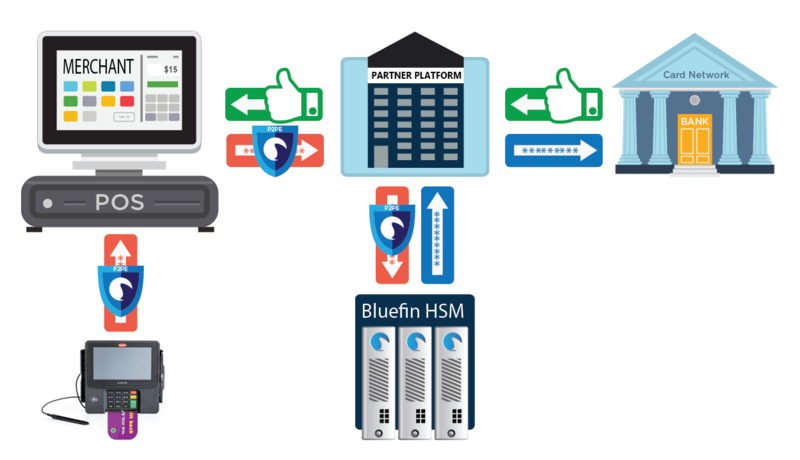 Bluefin provides our partners’ clients device and support assistance and each Bluefin Decryptx partner is assigned a dedicated relationship manager. As part of Bluefin’s PCI-validated P2PE solution package, we provide our clients access to our 100% online management system. Our patented P2PE Manager simplifies chain of custody management and documentation, while expediting laborious tasks such as annual audits.